Contrary to popular belief (and indeed their own name! ), centipedes don't necessarily have 100 legs. Unlike millipedes, centipedes have only 1 pair of legs per body segment, whereas millipedes have 2 pairs. 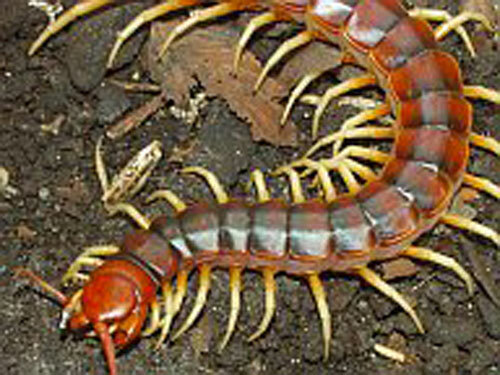 Centipedes are carnivorous, feeding on a variety of small animals (including frogs and lizards! ), but mainly insects. They catch their prey using their powerful jaws located at the front of the head. The last pair of legs in many centipedes is usually strong and brightly coloured, and although they look quite dangerous they are only used to grasp prey or wave in the air as a defensive display. Australian Centipedes can be found in a variety of habitats, but prefer moist, dark areas that are protected from the weather. They can often be found under rocks and logs, in leaf litter and under the bark of trees. Adult centipedes usually spend the winter months in a sheltered spot, coming out in spring to lay eggs. Eggs are generally laid in the soil, although there are some species that give birth to live young. Small Australian Centipedes are quite common in backyards. The larger species can give a painful, but not life-threatening, bite. Contrary to popular belief (and indeed their own name! ), centipedes don't necessarily have 100 legs. Unlike millipedes, centipedes have only 1 pair of legs per body segment (millipedes have 2 pairs per segment). Australian Centipedes are carnivorous, feeding on a variety of small animals (including frogs and lizards! ), but mainly insects. Larger Australian Centipedes can give a painful, but not life-threatening, bite. The last pair of legs in many centipedes are usually strong and brightly coloured. Although these legs look quite dangerous, the centipede bites with its powerful jaws.